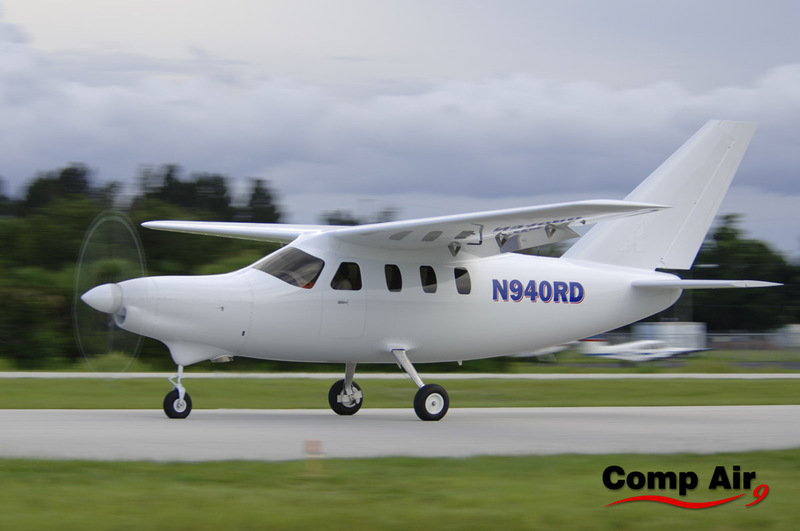 Sunday’s first flight of the Comp Air 9 carried with it the kit-builder's aspirations to enter the certified world. The 15-minute flight was “short and sweet”, says COO Bill Fedorko, but by Wednesday the FAA wasn't satisfied enough hours were logged to fly the $1.7 million six-seat aircraft to AirVenture as planned. "It was a gallant effort," he sighed. "At NBAA we'll have the announcement and the roll out." Plans to produce a kit version may be dropped after the FAA issued new homebuilding guidelines two weeks ago. "We're really trying to decipher the "51% rule," Fedorko states, and a kit version of the Comp Air 12 is definitely out. Funding came through Tuesday to build that $2,950,000 aircraft, he says. "We will start building the configuring version," he says, and they'll release more details next week on the investment. The interior of the 12 is almost done, Fedorko says, and it is past the mid-point of development. One is parked at Stand 230 next to a Comp Air 7. Next in development is the Comp Air 11 which, Fedorko boasts, “is going to be a rocket”. Its Honeywell TPE331-14GR engine will use 1,650hp to hit 360 knots at cruising speed. The first flight could come in January.